Earning a finish is certainly the sweetest way to win, but when you're down on the judges' scorecards with the clock ticking down, it becomes the only way to win. Inspired by Wednesday’s Fight of the Night-winning, come-from-behind win by UFC middleweight Yoel “Soldier of God” Romero over Derek Brunson in Atlanta, we looked back at some other bouts that were all but over... until they weren't. Here are ten fights where a fighter had dropped the opening two (or more) rounds and needed a stoppage to seal the deal -- and did just that. Click the UFC Fight Pass icon to watch the full bouts on UFC Fight Pass free through Feb. 28 (where available -- on UFC.TV outside of US/Au/NZ/Can). The lead-up to this collision of titanic heavyweights was phenomenal with Antonio Silva and Alistair Overeem getting into each other’s faces at every opportunity. For Bigfoot, it was about respect. For Overeem, it was about re-establishing his place at the top of the division. The first round saw the former K-1 kickboxing world champion light up Bigfoot with faster strikes and mobility. The second round was more of the same, but with taunting from Overeem and a good shot from Silva to close out the round. By the third, Bigfoot had had enough and simply bullied Overeem against the cage, then ended the bout with his enormous fists 25 seconds in. For Silva, respect came in the form of a memorable win -- and a Knockout of the Night bonus check. In a rematch of a fight first held two years prior, Pete Sell looked to avenge his knockout loss to Nate Quarry. With two rounds in the books, it looked like “Drago” was going do just that. The middleweight Ultimate Fighter alumni went toe-to-toe on the feet with Sell seemingly getting the better of it, piling on points with a couple of takedowns to boot. “The Rock” was visibly frustrated and struggled to find his rhythm. As the third round kicked off, the two met in the middle. When Sell reached for a lead left hook, The Rock returned with a drilling right hand that dropped Drago flat on the floor, giving Quarry the win 44 seconds in. In between rounds, Tim Boetsch's head coach Matt Hume didn’t pull any punches: "The Barbarian" needed a stoppage if he was going to walk out of opponent Yushin Okami's homeland with a win. The opening two stanzas in Japan showed a motivated Okami with sharper striking than previously seen. Okami used his length and power to dominate Boetsch so badly that the end of the second round saw The Barbarian upside down against the cage eating punches from “Thunder." But a new world opened in that final round as Boetsch came out swinging, and a blocked headkick still staggered Okami. With The Barbarian seeing the opening he needed, Boetsch clubbed Okami with uppercuts from inside the clinch, which finished the big middleweight at just under a minute of the final frame (:54). Unlikely comeback win doesn't even begin to describe it: Chicago police officer and UFC heavyweight Mike Russow was absorbing without a doubt the worst beating of his career in the first 10 minutes of the UFC 114 bout against hot prospect Todd Duffee. In round one alone, Duffee fired off 100+ significant strikes, which were clearly taking their toll on Russow. Entering the final five, the former NCAA Division I wrestler had broken his left arm blocking a kick and was reduced to jabbing with his right. As the hulking Duffee began slowing down from all his offensive output, Russow snuck in a right that clipped Duffee and dazed him. From there, Russow fired a second right as Duffee reeled, and the big fella was down for good at 2:33 of the third. The Las Vegas crowd erupted and Russow became the proud owner of a Knockout of the Night bonus. 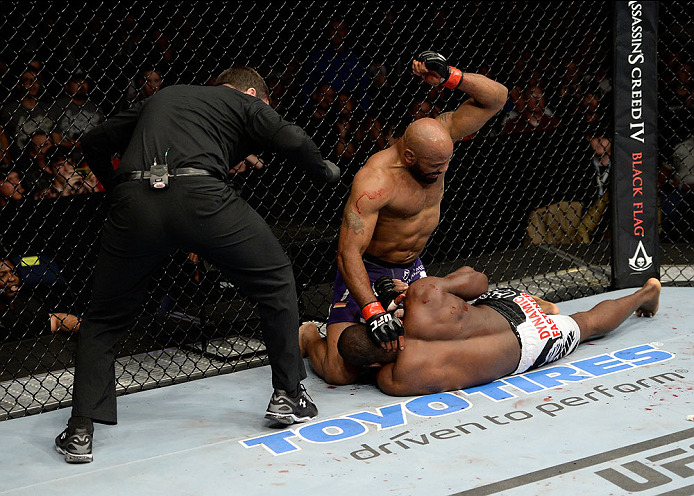 Wednesday night in Atlanta just didn't seem to be going Yoel Romero's way. The 2000 Olympic silver medalist in freestyle wrestling was getting beaten to the punch by the younger middleweight Derek Brunson in rounds one and two. Romero even absorbed a devastating headkick early on in the bout, but powered through somehow. With five minutes left on the clock, Romero looked to be the fresher man, but the period played out much like the others. But when one has debilitating KO power like Romero does, victory is never out of reach. A late rally of heavy leather from the Soldier of God took its toll on Brunson, and Romero stalked the wounded Brunson around the Octagon. Romero dropped Brunson and stayed on him, alternating between punches to the face and elbows to Brunson’s body, which brought the referee to intervene at 3:23. UFC Fight Pass replay available in US Feb. 15 - re-airs on FS2 on Jan. 18 at 2 am ET/11pm PT, on Jan. 19 at 8/5 am, and on Jan. 20 at 1a/10p. Check listings for more. One fight removed from back-to-back controversial decision losses, “The Hitman” Martin Kampmann found himself entering another unsure third round against Thiago Alves in Sydney, Australia. The final stanza played out much like the first 10 minutes with the 170-pounders nearly mirroring each other strike for strike. With about a minute remaining, “The Pitbull” scored a takedown and seemingly claimed the fight... until Kampmann used some clever BJJ to reverse into top position with a guillotine choke. Letting another close fight slip through his fingers wasn’t in the cards as Kampmann forced the tap at 4:12, earning The Hitman Submission of the Night. Half a dozen years before he stunned the world by winning the UFC welterweight championship off of Georges St-Pierre, Matt Serra’s most famous moment in the Octagon was getting knocked out by a spinning back fist from Shonie Carter. At UFC 31, the first American to receive a BJJ black belt under Renzo Gracie had taken round one on the ground, round dos in the clinch against the cage, and round three appeared to be only moments away from netting Serra a 30-27 unanimous decision. But “Mr. International” had a different idea when he threw MMA’s equivalent of the Hail Mary pass, which connected perfectly with knuckles to forehead with just nine seconds left in the fight. The key to Carter’s flashy finish was simple - he set it up by throwing a left high kick, using its rotation to conceal his positioning as he turned and spun into the strike. At the time of this stoppage, 20-year-old wunderkind Rory MacDonald was undefeated and had just taken it to former WEC welterweight champion Carlos Condit for 10 minutes with five to go. The final round started much like the other ones with MacDonald getting the better of the standup, but Condit gained momentum by capitalizing with ground and pound. That’s when MacDonald appeared to hit a wall, and “The Natural Born Killer” smelled blood. Condit attacked MacDonald relentlessly with strikes from on top. With MacDonald trapped against the cage and taking punishment, the referee had seen enough, calling the fight and earning a chorus of “boos” from the partisan Canadian crowd who saw MacDonald's decision victory taken from him with 7 seconds remaining. In 10 minutes of fighting, Muay Thai specialist John “Doomsday” Howard had only landed 2 significant strikes against veteran submission magician Dennis “Superman” Hallman. It wasn’t the most exciting two rounds, but Hallman was clearly up on the scorecards and making the welterweight bout a grappling match. With one period left to make his stand, Howard came out swinging and even scored a pair of takedowns, but that still wasn't going to be enough to net Howard a third consecutive Octagon win. Fortunately for him, the referee inadvertently came to his rescue by forcing a standup in the last few seconds. Upon restarting, Howard swung for the fences, connecting squarely with a left hooking haymaker, which spelled doom for Superman at the time of 4:55. There are not many stoppages in UFC history more famous or dramatic than former UFC middleweight champ Anderson Silva’s triangle armbar of Chael Sonnen, which took place an absurd 23 minutes into their epic title fight in 2010. For a full year, the challenger Sonnen vowed to bring the fight to Silva and beat him. The NCAA Division I All-American wrestler from University of Oregon shot and scored on takedowns in the first 20 minutes and kept Silva under him for almost the entirety of the fight. As the final round started, Sonnen took Silva down again, which everyone and their mother knew meant UFC fans were only a few scant minutes away from a new champion. But in true champion style, "The Spider" snatched victory from the jaws of defeat. Silva got wrist control on Sonnen, shoved his hand past Silva’s own leg, and locked up a triangle choke -- a submission that had infamously caused three of Sonnen's past pro losses. As Sonnen tried to free himself by leaning back, BJJ black belt Silva cinched up Sonnen’s prone arm, forcing the tap to the combination submission at 3:10 of the fifth round -- less than two minutes away from Chael being crowned champion.